The principal challenge was to convert existing hotel bedrooms into private residences while maintaining the 5-star quality standard already associated with the Four Seasons hotel. Technical and construction difficulties associated with a project of this nature had to be overcome and this was coupled with an additional challenge to maintain the 5-star hotel operating during the conversion project. A programme and budget had to be established along with a concise client brief. McCarthy & Associates put in place an experienced design team and main contractor. Both had previous experience in 5-star hotel and residential projects. The project team also had previous experience with the operations of the hotel and the construction of the hotel itself. A detailed client brief was established and communicated to the appointed team. A Construction programme was established that ensured minimum disruption to the day to day operation of the hotel. McCarthy & Associates arranged a number of design team and pre-contract meetings to formulate and put in place a system of working on site which fitted in to the practices and procedures of the hotel operations. We undertook careful planning and scheduling of noisy works at low occupational periods, regularly monitored the works and altered the systems and procedures as necessary to keep the disruption to the hotel to a minimum. McCarthy & Associates ensured the design team worked closely together in the design and specification of the new apartments and ensured only top quality materials and workmanship were used. We supplemented this through a high level of management and number of inspections throughout the works programme. Whilst a number of technical problems arose throughout the conversion process, close management by McCarthy & Associates of the design team and main contractor ensured speedy and satisfactory solutions were found. The conversion project was concluded with minimum disruption to the hotel operations, all major events scheduled during the works programme were facilitated and the hotel managed to maintain the anticipated revenue stream during the works which minimised the impact on the overall cost of the project. The end result was a scheme of premium exclusive private residences which were completed to the highest of quality in terms of design, layout, materials and finishes. The completed residences blend in seamlessly with a 5-star premium Four Seasons standards. 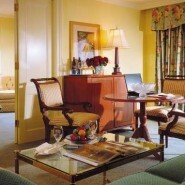 McCarthy & Associates have subsequently been appointed to manage additional works carried out at the Four Seasons hotel.